Transmission electron micrograph image of A. dehalogenans 2CP-C. Results: Recent scientific findings show that the bacterium Anaeromyxobacter dehalogenans can efficiently use either organic carbon or hydrogen as an electron donor—or energy source—to reduce the solubility of uranium. This could benefit cleanup efforts at the U.S. Department of Energy's Hanford Site, where subsurface sediments have electron donor variability that may work with versatile bacteria such as Anaeromyxobacter to make uranium less risky to the environment. A research team led by Pacific Northwest National Laboratory investigated mechanisms involved in reducing radionuclide contaminants by A. dehalogenans. At the Hanford Site, uranium and technetium are contaminants whose migrations in the subsurface are anticipated being a major risk factor to the Columbia River in the future. Biotransformation of uranium and technetium can reduce their mobility in the subsurface by converting them to less soluble forms, thus decreasing their eventual threat to the river. Previously, scientists showed that A. dehalogenans coupled cellular growth with uranium reduction; however, they knew little about the biotransformation product of this reaction or the interaction of this bacterium with other radionuclides. In this study, scientists observed that the electron donor source provided for uranium reduction influenced the reduction rates and the extent of aggregation of extracellular uraninite, a solid form of uranium resulting from microbial reduction. Their results were published in the February 2009 issue of Environmental Microbiology. 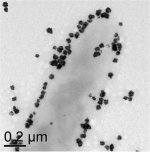 They saw that when Anaeromyxobacter cells were provided with an organic electron donor source, distinct nanoparticle aggregates formed that were ten times larger in diameter than individual nanoparticles produced during hydrogen oxidation. Similarly, individual extracellular technetium dioxide nanoparticles aggregated in clusters greater than 50 nm in diameter, although this was not linked to the electron donor source. Why it matters: The results of this work provide the scientific community important insights into Anaeromyxobacter electron transfer to contaminants found at DOE sites that will aid in finding remediation solutions. Recent findings indicate that members of the Anaeromyxobacter genus contribute to metal and radionuclide reduction in contaminated groundwater and sediments at DOE's Oak Ridge Field Research Center in Tennessee. They may also be present at other contaminated DOE sites, including Hanford. Methods: Using high-resolution electron microscopy, the scientists determined the localization, size and degree of aggregation of the nascent nanoparticles. These findings provide a better understanding of the importance of electron donor type on radionuclide reduction by Anaeromyxobacter and the nature of the insoluble oxide precipitates. They then used kinetic studies and transmission electron microscopy to determine the localization, size and degree of aggregation of the less-soluble technetium and uraninite nanoparticles. What's next: The results produced in this study suggest that Anaeromyxobacter uses biomolecular mechanisms similar to other model metal-reducing bacteria such as Geobacter and Shewanella to transform radionuclide contaminants. 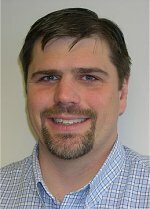 Further investigations will be needed to consider the biomolecular mechanisms contributing to metal reduction by Anaeromyxobacter and the physiochemical properties of the nanoparticulate end products and their long-term behavior in porous subsurface such as that at the Hanford Site. Acknowledgments: The scientific team included Matt Marshall, Alice Dohnalkova, Dave Kennedy, Andy Plymale, Oleg Geydebrekht, John Zachara, Jim Fredrickson and Alex Beliaev at PNNL; Sara Thomas and Frank Löffler at the Georgia Institute of Technology; and Rob Sanford at the University of Illinois at Urbana-Champaign. This work was supported by DOE's Environmental Remediation Sciences Program, and high-resolution transmission electron microscopic imaging was performed at the Environmental Molecular Sciences Laboratory through the Scientific User Proposal system. EMSL is a DOE national scientific user facility located at PNNL. Reference: Marshall MJ, AC Dohnalkova, DW Kennedy, AE Plymale, SH Thomas, FE Löffler, RA Sanford, JM Zachara, JK Fredrickson, and AS Beliaev. 2009 Electron donor-dependent radionuclide reduction and nanoparticle formation by Anaeromyxobacter dehalogenans strain 2CP-C. Environmental Microbiology 11:534-543 (doi:10.1111/j.1462-2920.2008.01795.x).